Russian President Vladimir Putin has arrived in the Croatian capital city of Zagreb to attend the Southeast European country's Energy Summit. He is scheduled to meet Balkan leaders for talks on the region's energy strategy. He says, as a leading supplier of the world's energy, Russia is committed in cooperating with the Balkan countries in energy. He outlined a number of pipeline and energy projects in Bulgaria, Serbia, Macedonia and Hungary designed to link the Black Sea, Caspian Sea and the EU. In his message of congratulations Putin stressed that by organising the energy summit, Croatia had confirmed its international authority. 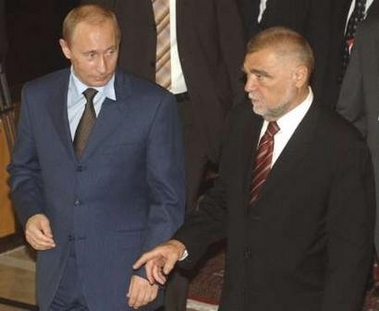 On occasion of Croatian Statehood Day, Croatian President Stjepan Mesic on Monday received a message of congratulations from the President of the Russian Federation, Vladimir Putin, in which he voiced his satisfaction that "concrete agreements had been reached (at the energy summit in Zagreb) about a number of key directions of cooperation that creates very good preconditions for upgrading the dialogue between Russia and Croatia to a new quality level", the President's Office said in a statement. 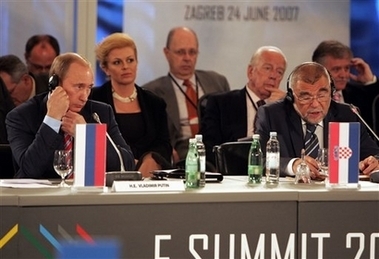 In his message, Putin assessed that the realisation of the Croatian president's initiative on the holding of the Energy Summit of the South-East of Europe was "a confirmation of Croatia's international authority". The Russian president also believes that the results of the summit would significantly contribute to solving regional and general European tasks in the field of energy. Commenting on his talks with president Mesic in Zagreb, Putin concluded that they were fruitful and were proof of a good perspective for the overall development of relations between the two countries.